The Georgia General Assembly adjourned on Friday after completing the 16 th legislative day. The Legislature will reconvened on Tuesday, February 19, 2019 at 10:00 am and will meet four days this week. Governor Kemp announced last week that he will be seeking Medicaid Waivers to develop a state focused plan to cover uninsured Georgians. Legislation to move forward with a Waiver was introduced by the Governors Floor Leaders this week. Also, Governor Kemp signed his first bill into law on Friday. SB 25 , sponsored by Senator Bill Heath, clarifies when the driver of a vehicle needs to stop, or not stop, upon encountering a stopped school bus. Last week was a very active week with budget hearings and committee meetings. The Amended budget is moving through the process quickly as the Senate Appropriations Committee held a meeting at 8:00 am on Tuesday, February 12, to consider the 2019 Supplemental Budget. Meanwhile, House budget subcommittees are working on the FY 2020 budget. On Tuesday, the Senate Regulated Industries committee held hearings on SB 2 and SB 17 pertaining to rural broadband deployment. There was much debate as Senators are working to find a path to deploy broadband to unserved communities. On Wednesday and Thursday, the House Special Committee on Access to Quality Healthcare held hearings on HB 198 which would significantly revise the Certificate of Need law. Heavy opposition has been mounted by the hospital community over how the measure will impact their operations and concerns regarding services provided to the uninsured. Legislation enforcing spacing between digital billboards passed Senate Transportation Committee unanimously and is now headed to the Senate Rules Committee. A measure was introduced last week regulating the growth of Medical Marijuana in Georgia for medical purposes. Also, a constitutional amendment was introduced to allow Georgians the ability to approve and legalize horse racing and wagers at venues in Georgia. On Thursday, Senate Regulated Industries heard SB 66 and the House passed HB 184 , which are companion bills, dealing with the deployment of telecom technology known as small cell. These companion bills are a result of a compromise among local governing authorities and wireless companies seeking to improve wireless coverage in Georgia. On Friday, the House assigned HB 316 by Representative Barry Fleming to the Government Affairs committee. This bill is a result of work performed over the interim by a commission tasked with making recommendations to upgrade Georgia’s voting machines. Last week, GeorgiaLink sponsored the Working Families Caucus luncheon and helped host the Annual Georgia Pest Control Association barbecue lunch for the legislature. On February 23 rd , the 3 rd Annual Zell Miller Legacy Celebration honoring Governor Nathan Deal will be held at the Ritz Carlton in Atlanta beginning with a reception at 5:30 pm. On Tuesday night February 26 th , the Annual Black Caucus Heritage Dinner will be held at the Georgia World Congress Center. The Glenn Burnett Scholarship was established in the early 80's. Since 1986 over $134,000.00 has been awarded to 150 GPCA member's children to support their attendance at a Georgia College or University. Named after Glenn Burnett who dedicated more than 20 years of service to the association, the Scholarship program has continued to grow in participation and funding through the years. To apply for the 2019 Burnett Scholarship please visit the GPCA website by clicking here or click here to download the PDF scholarship application. All applications must be received in the GPCA office by April 15, 2019. Registered Employees are required to meet continuing education training requirements in each category of registration. The training requirements for registered employee includes 8 hours HPC, 8 Hours WDO and 3 Hours FUM. The training must be completed on or before February 28, 2019 to be applied toward the 2019-2021 renewal period. If a registered employee took and passed the registered employee exam on or after October 1, 2018, the employee is exempt from having to meet the re-registration training requirements. The 2019-2021 renewal period is right around the corner. 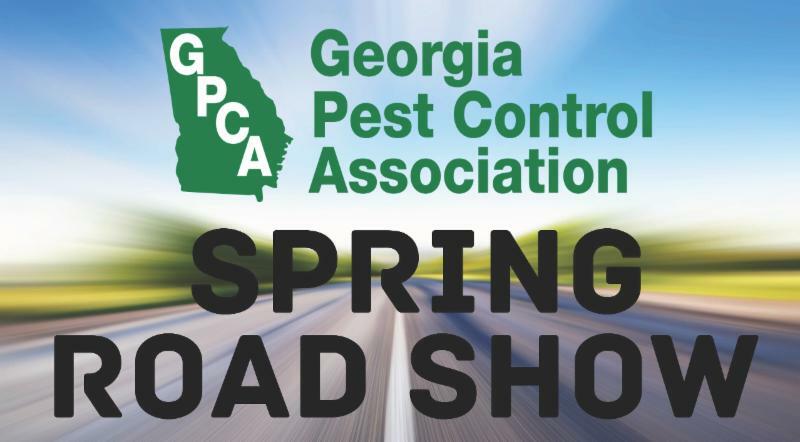 If GDA can assist you, please call 404-656- 3641 or email pest@agr.georgia.gov . Tim Taylor is the structural pest and pesticide certification and training specialist for the Georgia Department of Agriculture. 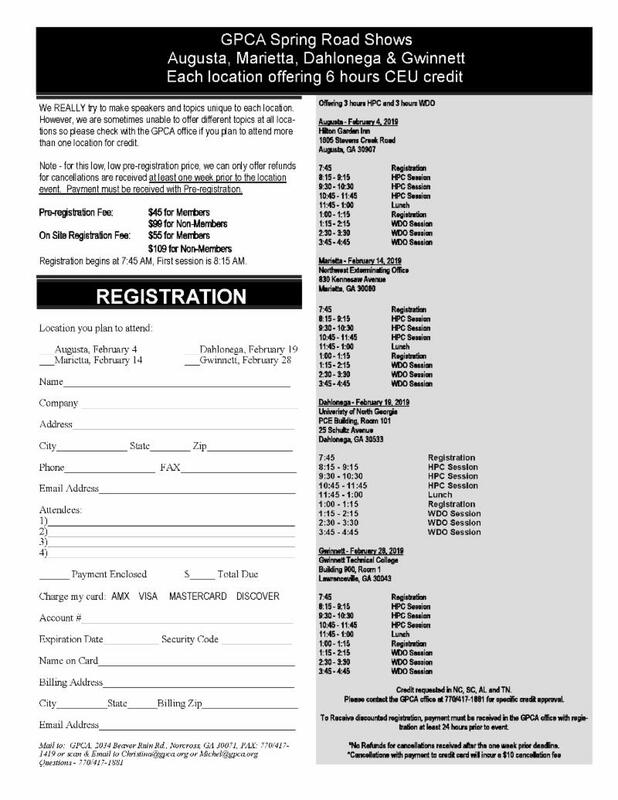 GPCA CRAM DAY FRIDAY, April 5, 2019 - REGISTER NOW! On Friday, April 5th, you will have another opportunity to act like a college student before finals – CRAM, CRAM, CRAM!!!!! The CRAM day goes from 8 AM to 5 PM with instructor Jim Chase reviewing as much as he can Cram into the time to help you study for the state PCO exam. The morning program (about 8 to 11:30) is dedicated to HPC subjects. Middle of the day (about 11:30 to 1:30) is Rules and Regulations. The rest of the day (1:30 to 5 PM) is spent on WDO. GPCA provides pizza so you don’t have to break your learning process. If you have taken the GPCA PCO course within the past 12 months, the cost is $50, per session, or $100 full day. If you have NOT taken the GPCA PCO course, the program is $75 morning, $75 afternoon. Non Member Prices —$150 1/2 day, $300 full day. ﻿Register by calling the GPCA office at 770-417-1881. Payment must be received when registering. No refunds for no shows or cancellations received less than 24 hours in advance. Are you still looking for CEU's before the February 28, 2019 deadline?